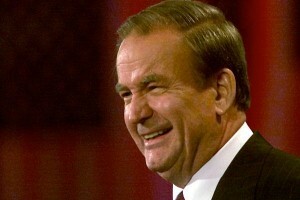 Pat Buchanan has been dismissed by MSNBC, the left-leaning news network, four months after the channel suspended him. Buchanan says the calls for his firing began with the publication in October of his book “Suicide of a Superpower: Will America Survive to 2025?” about America’s decline, which critics have called racist, homophobic and anti-Semitic. Buchanan (a former White House aide to Richard Nixon and Ronald Reagan and a former Republican presidential candidate) had been with MSNBC as a political analyst since 2002. Among the groups he cites as his accusers – Color of Change, Media Matters, the Anti-Defamation League and the Human Rights Campaign. For every liberal action there is an equal and opposite conservative reaction, and Sean Hannity gave his reaction tonight to MSNBC finally parting ways with controversial commentator Pat Buchanan after ten long years. Buchanan spoke to Hannity in an exclusive interview, and while the first part of it focused on both men attacking MSNBC, Hannity did grill Buchanan over his racially charged comments about the dangers of America no longer being a majority-white country. Both Buchanan and Hannity agreed that “elements in our society” like Media Matters are unfairly targeting conservatives in the media by pressuring network brass to drop someone who presents controversial viewpoints, as Buchanan does. The ex-MSNBCer was so disgusted with Media Matters, he encouraged Tucker Carlson to keep his fight against the group going. Hannity credited Buchanan with being intellectually consistent over the past decade, and wondered what changed. Buchanan couldn’t help but wonder what it was liberals are afraid of. Certainly not him, just one old man whose ambitions to serve in public office ended in the 90′s, but Buchanan suggested they’re afraid of “the people” who might listen to another point of view and change their minds. But that’s where the joviality between the two ended. Hannity acknowledged that while Buchanan’s views haven’t changed, those views do include some eyebrow-raising statements about race. Buchanan defended the chapter in his book called “The End of White America” to a surprisingly confrontational Hannity. Media Matters parroted the party line – He has blasphemed! On November 2, Abe Foxman of the Anti-Defamation League, who has sought to have me censored for 22 years, piled on. And what else explains the shrinkage of the U.S. Jewish population by 6% in the 1990s and its projected decline by another 50% by 2050, if not the “collective decision of Jews themselves”? Let error be tolerated, said Thomas Jefferson: “so long as reason is left free to combat it.” What Foxman and ADL are about in demanding that my voice be silenced is, in the Jeffersonian sense, intrinsically un-American. This entry was posted on Saturday, February 18th, 2012 at 4:07 am	and is filed under Politics. You can follow any responses to this entry through the RSS 2.0 feed. Both comments and pings are currently closed.